This is a really amazing bumbag and recommended for executive, cyclists and students alike. This black vegan is a quality lightweight fabric. It fits comfortably on any size from small through to extra large. It boasts a black waterproof lining inside. This is a practical, multi-purpose bumbag which will never go out of style! 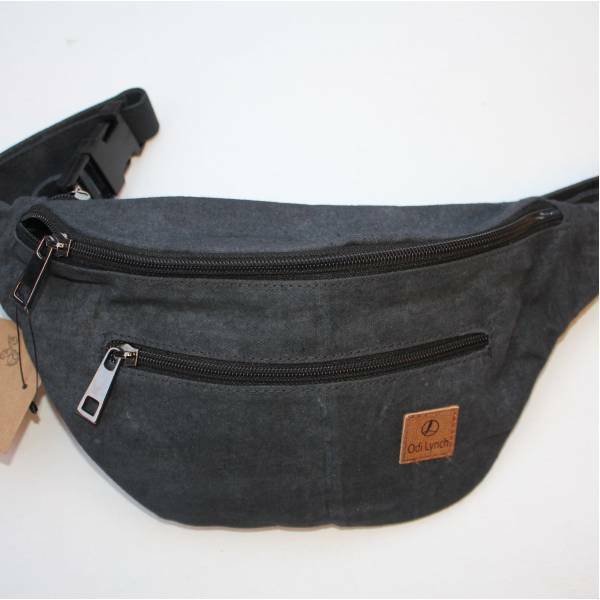 This lovely vegan bumbag measures 26x15x9 cm or 10x6x3.5 inches, front pocket 16x8 cm or 6x3 inches, and back pocket 22x15 cm or 8.5x6 inches. The belt measures between 65 and 100 cm by 2.5 cm or 25.5 and 39 inches by 1 inch and the buckle is 5 cm or 2 icnhes.